An important exhibition in the Plantin-Moretus Museum in Antwerp in 1904 presented an overview of modern book art in Europe and America, including works by, among others, Flemish, Dutch, French, German, American, Scandinavian, Italian, and Swiss publishers. Many were on loan from the publishing houses, others, especially private press books, came from private collections in Belgium and The Netherlands. Vale Press books were displayed prominently, and they were on loan from Edward B. Koster (The Hague), N.J. Beversen (Zwolle), and J. Visser (Rotterdam). As a classicist, Nicolaas Johannes Beversen followed a career in higher education at schools in Gorcum, Arnhem, Zwolle and, finally, Leiden; in the last two places, he was appointed as head master of a grammar school. In 1927, he retired, and subsequently sold some of his books and art works. He died in 1932 (he was born in 1860). The Beversen collection was somewhat of a riddle, as I had found several auction catalogues containing books and art works from his collection, but the Vale Press books were lacking. In April 1933, the main part of his library was auctioned in The Hague by Van Stockum's Antiquariaat. There were almost 900 lots ranging from history and topography to languages and special editions. 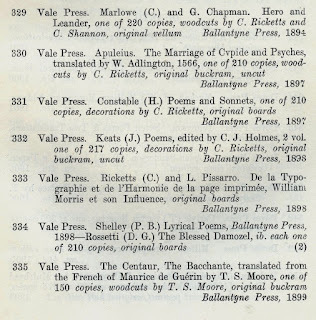 Among the 'Presses spéciales' [private presses] were publications of the Beaumont Press, the Nonesuch Press, The Riverside Press, and Dutch private presses. Classical works were sold by Burgersdijk & Niermans in Leiden (May 1933). Later, in April 1936, another part of his collection was sold by Van Stockum's Antiquariaat. However, the auction catalogue doesn't distinguish the several provenances of books, although the section 'Publications de luxe' contains books with dedications or letters to Beversen, such as Fr. Porché's book on Paul Valéry et la poésie pure (lot 1895). 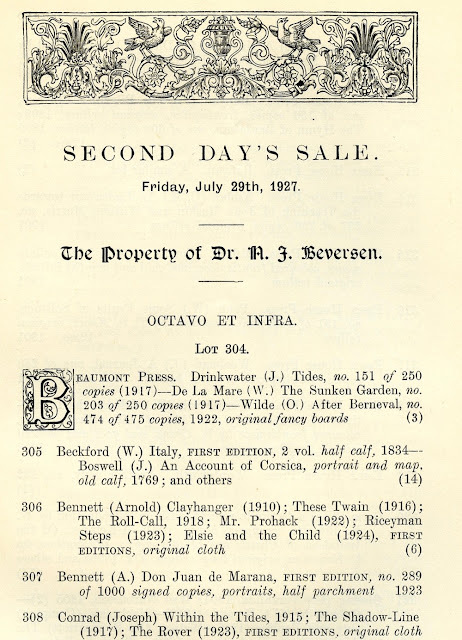 The private press section contains some Nonesuch Press titles, and among these we find Ricketts's recollections of Oscar Wilde (published 1932). Recently, in a pile of discarded auction catalogues, I came across a catalogue that explained the absence of Vale Press books from Dutch catalogues. This part of Beversen's collection was offered for sale by Sotheby and Co. on Friday 29 July 1927. Was Beversen an exception, selling his books in London? - for a Dutch collector this seems quite a step. Exceptional too, was that he sold large parts of his collection during his lifetime. Usually, such collections came on the market after the demise of the collector. However, Beversen had been exceptional as a collector from the start, collecting private press books around 1900 - when Dutch collectors were not keen to buy contemporary book art. 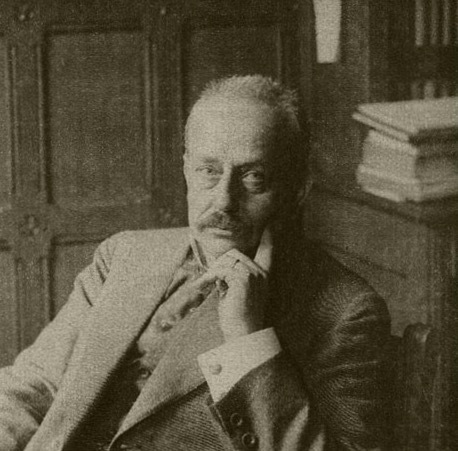 The 1904 Antwerp exhibition displayed Beversen's versatility as a collector; books from his library were shown in sections concerning France, Germany, Italy, and Great Britain. The N.J. Beversen section in Sotheby's catalogue for 28-29 July 1927 consisted of lots 304 through 379, containing 243 volumes with literary books by Conrad, Dickens, Keats, Gissing, and others. 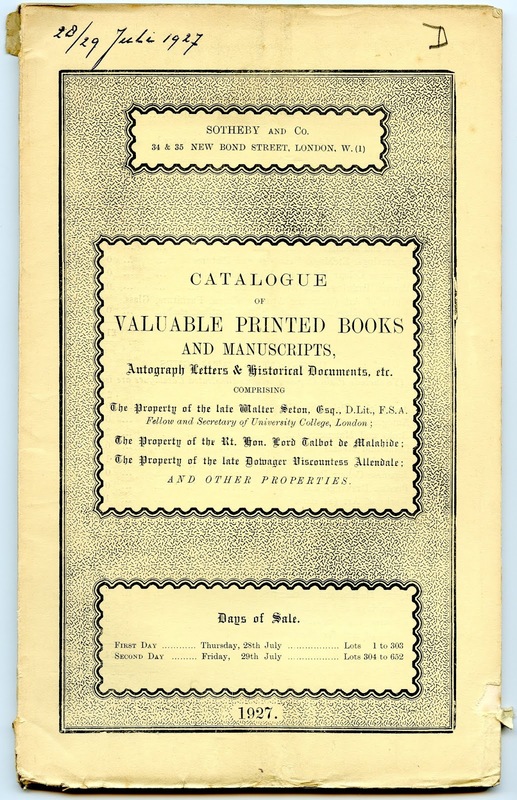 There were vellum copies of Essex House Press books, and selections of books published by the Beaumont Press, Nonesuch Press, Doves Press - no books from the Kelmscott Press featured in the catalogue. 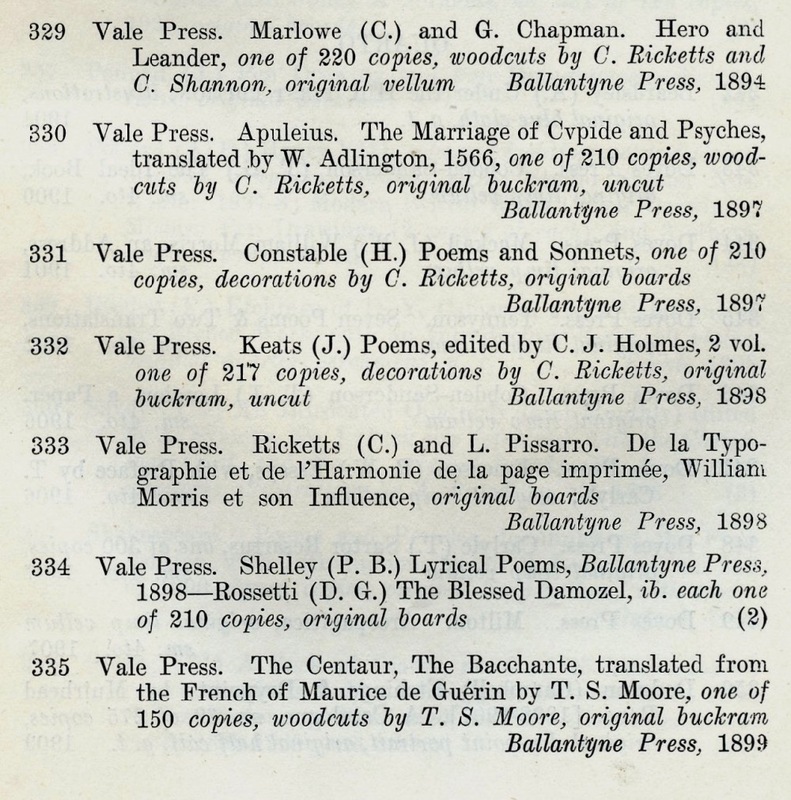 There was a fair deal of Vale Press books, including an incomplete set of the Vale Shakespeare - Beversen got hold of 32 volumes of this set of 39 Shakespeare editions. 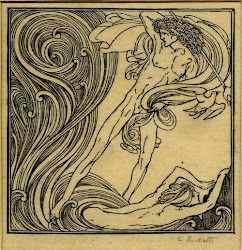 He possessed copies of Hero and Leander, the English and the Latin versions of Apuleius, and the Vale Press editions of Keats, Shelley, and Constable. Ricketts's pamphlets on the art of printing (one co-written by Lucien Pissarro) formed part of his collection, as well as the translation of Maurice de Guérin's The Centaur, The Bacchante - of which a mere 150 copies were printed. But Beversen's collection was an incomplete one; his VP Shakespeare collection lacked seven volumes, and he didn't acquire copies of many other Vale Press books, and the same goes for the other books designed by Ricketts (such as Wilde's The Sphinx), or books from other private presses, such as the Doves Press, of which only seven books were listed in the catalogue. At the time, he was probably the only Dutch book collector who not only acquired his books from the other side of the Channel, but also brought them back to the British Isles. One wonders where they have gone since - and it seems impossible to trace them; as far as I know, they bear no bookplate.